Bill is the founder and has been President of Black Creek Investment Management since 2005. He has spent his career of more than 36 years as an investment analyst and portfolio manager. 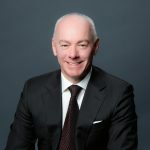 Prior to Black Creek, Bill was a Senior Vice President with AIM Trimark, acting as lead manager for the Trimark Fund and Trimark Select Growth Fund. Bill has also managed mutual funds for Mackenzie Financial (Universal Growth Fund and Ivy Foreign Equity Fund). And he was an investment analyst at Confederation Life Assurance Company. A graduate of the University of Western Ontario with an Honours Bachelor of Arts in Business Administration, and is a CFA Charterholder.